The Center for Colonoscopy Excellence, a division of San Francisco Gastroenterology, was founded by Dr. Frank Farrell, a board-certified gastroenterologist and San Francisco physician of nearly 20 years. Our physicians and staff are dedicated to providing the most comfortable and professional colonoscopy experience available while utilizing state-of-the-art equipment and technology. The Center for Colonoscopy Excellence is the first in the San Francisco Bay Area to focus entirely on screening colonoscopy and to offer this service exclusively. We provide Propofol by board-certified anesthesiologists, and we are the first to implement Propofol for sedation in an ambulatory endoscopy center in San Francisco. Each of our staff members are dedicated to continually improving our standard of excellence. Dr. Frank Farrell is board-certified in Gastroenterology and a Fellow of the American Gastroenterological Association (AGA). He has extensive experience as a gastroenterologist with an interest in colon health and screening colonoscopy. Dr. Farrell has performed over 10,000 colonoscopies during the course of his career. 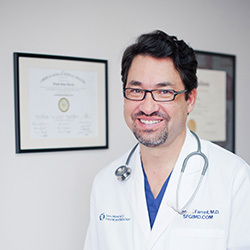 Dr. Farrell’s polyp detection rates and cecal intubation rates (measurement of doing a complete colonoscopy) exceed national standards, making him one of the most experienced and reliable gastroenterologists in the San Francisco Bay Area. Dr. Farrell is married and has three daughters. Dr. Farrell enjoys running, cycling, snowboarding, and traveling. Dr. Cathleen Cabansag attended medical school at Loma Linda University after earning a degree from Pacific Union College in Foods and Nutrition. While in medical school, Dr. Cabansag participated in medical volunteer opportunities at Guam Adventists Hospital in Guam and Penang Adventist Hospital in Malaysia. 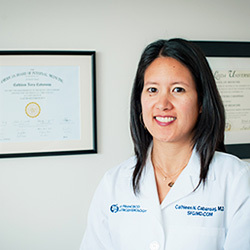 She went on to complete her residency in Internal Medicine and fellowship in Gastroenterology at California Pacific Medical Center in San Francisco. Dr. Cabansag is married and when not practicing medicine, she enjoys spending time with her family and discovering local restaurants with her husband.